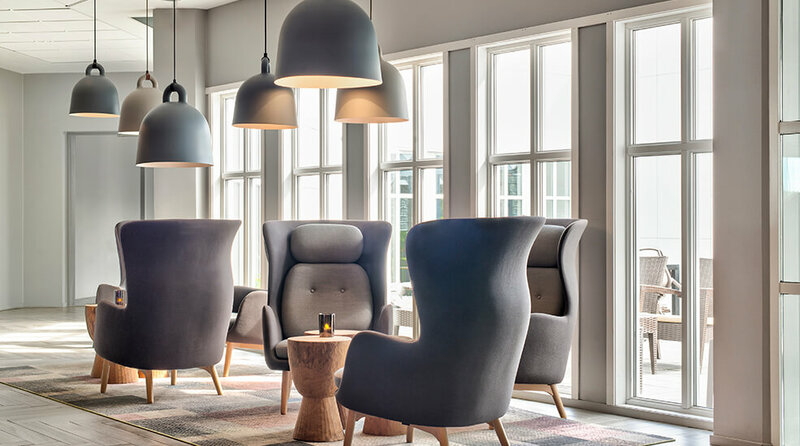 With open sea and the sound of waves just outside the front door, and a Norwegian tropical paradise indoors, we welcome you to Quality Hotel Skjærgården. From 24 November to 15 December 2018, we will be hosting several Christmas buffets and shows here at the hotel every Friday and Saturday. Please note that noise levels will be higher than usual during this time with music, dancing and festivities until around 2am. Unfortunately, there will not be any activities for children during this time. If you have an exisiting booking, but would prefer to change your dates to another weekend, please let us know and we will assist you. We are a Kids' Hotel all year round. That means that kids are always welcome and are the centre of attention of everyone working at the hotel. We have activities for children of all ages, particularly during weekends and school holidays when lots is happening. The Quality Hotel Skjærgården is a cash-free hotel. This provides a safer working environment for our staff as it reduces the risk of theft and burglary. It also means that we have more time to spend on taking care of our guests. More information about this can be found under FAQs. Our waterpark Badeparken is 4,000 m2 in size and has a 31˚C water temperature all year round – it's the closest you'll get to a tropical paradise in Scandinavia. The Badeparken is a popular break from the cold in the winter and a saviour for holiday makers when the summer weather fails. And, if the summer sun is shining, we also have an outdoor pool that also can be used during wintertime, we keep the temperature at 31 degrees Celsius inside as well as outside. We have plenty of experience when it comes to organising conferences and events. Here you can draw inspiration from nature and the sea air. We are more than happy to help you plan the perfect conference. Just a short walk or drive from the hotel, you'll find Langesund, a town with marine traditions dating back to 1570. This was one of the most important seafaring towns from early on in Norway's history. Many claim that Langesund is the sunniest town in Norway and, especially in the summer, Langesund is full of culture and street-life. Here you'll also find Wrightegaarden, the town's cultural centre and concert stage. This might be the most delightful courtyard in Norway. You'll find a large Geopark area near the hotel. Some parts are within walking distance, some you can reach by bike or by car. The Geopark shares knowledge about our geological cultural heritage and shows how geological processes and our own existence are connected. The Geopark is the first of its kind in Scandinavia to be supported by UNESCO. TIMEkspressen or Sørlandsekspressen to Rugtvedt, then five minutes by taxi to the hotel. The nearest train station is Porsgrunn (30 km) or Skien (40 km), then there's a local bus to the hotel. We recommend Bamble Taxi, phone +47 35 96 02 20. 1 conference room with space for up to 300 participants and 10 meeting rooms of different sizes. Torp in Sandefjord, 45 mins by car. Bus stop Badeparken: 200 metres.